Access session presentations, recordings and blog posts from CRE.Insights: The Last Mile. Separate fee and registration required. Discounted registration available for conference attendees. Please see the Course tab for additional information, including course modules and a schedule of the day. Time: 1:15 p.m. - 4 p.m. Explore the last mile as you’ve never seen it before with this tour featuring some of the nation’s most dynamic industrial players and projects. Watch Prologis’ Georgetown Crossroads project being constructed and examine a built-to-scale model of this trailblazing 589,615-square-foot, three-story fulfillment center. See e-grocery in action with a visit to Amazon Prime Now fulfillment center and Amazon Fresh Pickup facility in Seattle’s SoDo neighborhood and take a windshield tour of Starbucks’ corporate headquarters. Tour sponsored by Craft Architects. THIS TOUR IS SOLD OUT. To be added to a wait list, please email education@naiop.org. Take a drive-by tour of Class A space at the Des Moines Creek Business Park, developed by Panattoni Development in partnership with MetLife. The business park encompasses 1.1 million square feet of completed industrial space, 300,000 square feet of Class A office space and 500,000 square feet of industrial space currently under construction. The tour also includes a stop at Prologis’ Georgetown Crossroads where you can watch this innovative three-story fulfillment center being constructed and examine a built-to-scale model. Experience a one-of-a-kind winery that occupies the space that was formerly a Dr. Pepper bottling plant. Here you’ll get to taste the wines while enjoying other libations and tasty bites while you connect with other attendees. Be sure to take in the view of the main runways of Boeing Field along with the iconic profile of Washington’s Mount Rainier. Time: 7:30 a.m. - 4 p.m.
Time: 8 a.m. - 9 a.m.
Time: 8:45 a.m. - 10 a.m.
With over 50 percent of supply chain costs attributed to transportation, choosing an industrial facility or third-party logistics (3PL) company to house its goods has become one of the most important decisions a retailer can make. Competition for the right location is increasing, as distributors are willing to pay higher rents in strategic locations to reduce transportation costs and improve responsiveness. In this keynote session, supply chain and logistics expert Gregory Healy with Colliers International will identify the key industrial transportation factors you need to consider to make informed logistics decisions for your business. Time: 10 a.m. - 10:30 a.m. Choose your adventure: Meet new people and expand your network in this lively and engaging networking session, or network on your own. Time: 10:35 a.m. - 11:25 a.m.
As companies seek to streamline the last mile of a finished good to its final destination, traditional retail and industrial facility footprint models are giving way to new approaches to fulfillment. Dive deep into the current and anticipated impact of omnichannel retail on industrial real estate, including new fulfillment methods and models, dark store fulfillment and distribution center automation. Robots work most efficiently when left to their own devices – without human interference in their automated realm. While robots are unlikely to ever fully replace humans in industrial facilities, the increasing importance of harnessing automated technology to serve the needs of e-commerce businesses can’t be denied. Commercial real estate owners and developers must anticipate current and future technology in creating or repurposing e-commerce centers, making these facilities ready for humans and robots to work collaboratively. Examine the trends and technology being applied in order to streamline the last mile and how you can position yourself at the forefront. Time: noon - 12:45 p.m.
Time: 12:45 p.m. - 1:45 p.m. The last mile is one of the most complex and persistent open questions in development. Design solutions to the last mile challenge extend beyond fulfillment and distribution of goods, with application to broader economic development and urban revitalization. Explore design solutions to last mile issues across multiple disciplines, including: how the last mile challenge has defined several decades of industrial development, how design of the built environment is manifesting new opportunities for innovators, and how urban networks are evolving in response to technology and social movements. Time: 1:45 p.m. - 2:15 p.m.
Take the opportunity to expand your network and deepen existing relationships. Time: 2:15 p.m. - 3 p.m.
As America becomes increasingly consumer-centric – and consumers demand near instant delivery of goods to their doors – online grocery sales have continued to rise in popularity. According to research from Nielsen, online grocery sales reached $20.5 billion in 2016 and are expected to increase to $103.3 billion in 2025, making up 20 percent of total grocery retail sales. Examine how industrial real estate is tackling the logistical obstacles of delivering fresh and consumable products to consumers efficiently and reliably. As the home of Amazon’s first headquarters, Seattle has seen a massive change in the logistics landscape with both old and new industrial facilities being converted to play a role in the competitive last mile of the supply chain. Analyze costs, trends and customer service issues of the last mile with a focus on Prologis’ Georgetown Crossroads, an innovative industrial development project. Prologis has designed the future of urban industrial facilities with a revolutionary 589,615-square-foot, three-story fulfillment center – the first of its kind to be built in the United States – and what could become the model for modern industrial facility solutions. Time: 4 p.m. - 5 p.m.
Find a potential partner or exchange industry insights with other commercial real estate leaders. ** All topics, times and speakers subject to change. Colliers has invested in developing an internal consulting practice to support its clients as they determine their supply chain strategy. Gregg Healy leads this group. Healy is a graduate of UCLA and has an MBA from the University of Michigan. Having lived and worked in both Asia and Europe, Healy has a unique global supply chain background. Prior to joining Colliers, he served as vice president at Honda Logistics for over 10 years as well as owned his own 3PL and supply chain consulting firm. Darren Kenney is a VP, Investment Officer, West Region. In his role, he is responsible for all capital deployment activities including acquisitions, redevelopment and development of industrial product. Darren joined Prologis in 2008 as a Capital Deployment analyst underwriting transactions in Europe and Asia. In 2010, he joined the West Region where he currently focuses on sourcing opportunities in the Bay Area, Seattle and Portland. Darren has lead the companies Urban Infill Investment Strategy in select markets which the includes the acquisition and development of Prologis Emerald Gateway south of King County Airport. Darren holds a Bachelor of Arts degree from the University of Southern California and is a Bay Area native. He is an active golf member of the Olympic Club of San Francisco. Rick Kolpa is Senior Vice President, Market Officer for Prologis in Seattle, overseeing 16 million square feet of existing industrial facilities and 909,000 square feet of development. Prior to joining Prologis in 2010, he was co-owner of GGL Real Estate Services (formerly known as the R. J. Hallissey Company), where he led the company's efforts in leasing. Ms. Lanne has extensive experience and history with not only institutional investor/owners, but has been involved with over 80m square feet of transactions with e-commerce, distribution and warehousing tenants, giving her insight and access to decision makers and how they evaluate their real estate from site selection to lease execution. Shelton Mercer is an award-winning serial entrepreneur, innovation advisor, speaker and philanthropist. Shelton is Principal & Chief Innovation Officer at startup incubator/coworking provider 1776-Benjamin’s Desk (with campuses in Philadelphia, Washington D.C. and New York). Matt Powers is an Executive Vice President at JLL, responsible for leading and growing the company's emerging retail e-commerce distribution practice group. Michael Roe is a leader and the voice of a new generation of material handling professionals. With over six years of material handling experience, Michael has a strong understanding of the industry, creative solutions as well as an understanding of new trends and technologies. With more than 15 years of successful experience as a supply chain executive, David Schwebel leads the Swisslog business development team in their efforts to identify qualified business opportunities and support the development of strategic initiatives. He works closely with other worldwide Swisslog department heads to deliver the outstanding results that Swisslog clients have come to expect over the more then 100-year history of the company. Wilma Warshak has been a widely recognized leader in virtually all aspects of the industrial real estate advisory and brokerage business for more than 25 years. During that time she has represented major corporate clients and many of the nation’s largest institutional and private investors, including Prologis, TA Associates, James Campbell, Deutsche Bank, Cornerstone Advisors, CRG(Clayco) Prudential, Blackrock, IIT, Teutsch Partners, Port of Tacoma, GLP, Terreno, and Panattoni, as well as prominent corporate users. Craft Architects is the Puget Sound leader in speculative and build-to-suit industrial and the architect for Prologis' Georgetown Crossroads. Craft is currently working on more than 30 industrial buildings exceeding 9,000,000 square feet on the West and East Coasts and Mexico. Summit Law Group is committed to building partnerships with our customers, and delivering the highest-caliber work. Our mission is to think creatively, to proactively formulate and pursue the most effective, efficient solutions to your legal needs with small, dedicated teams. Kane Environmental, Inc. is a full-service environmental services and contracting firm specializing in the complete clean-up cycle of contaminated properties. Our team of geologists, environmental engineers and scientists have the expertise to handle all stages of a development project. All cancellations must be in writing. Cancellations of conference registrants received after February 9, 2018, will be charged a fee of $100 USD per attendee. Cancellations of course registrants received after February 9, 2018, will be charged a fee of $50 USD per attendee. Substitutions are permitted. Nonmembers substituting for a member will pay the fee difference. Cancellations received after February 26, 2018, will forfeit the full registration fee. No refunds will be made for no-shows. Special events (tours) are nonrefundable. Cancellation notices should be sent via fax to the NAIOP Education Department at 703-904-7003 or emailed to education@naiop.org. Advance registration for Last Mile is now closed. Onsite registration will be available at the NAIOP registration desk. Students: To register, please contact the NAIOP Education Department at 800-666-6780 or fill out the PDF form. Please email (membership@naiop.org) or fax (703-904-7003) a copy of your current Student ID. Registration cannot be processed without proof of current enrollment. Contact Christopher Ware or 800-666-6780, ext. 127, to reserve your sponsorship today. 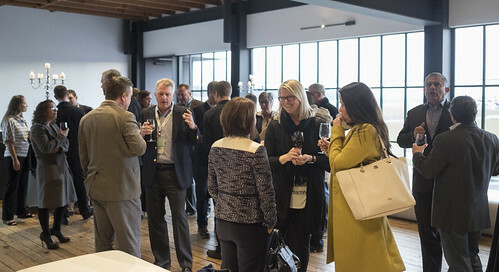 See the Why Attend tab for demographic information on the industrial power players from across North America who attend NAIOP’s industrial conferences. Leading developers, brokers and service providers sponsor NAIOP industrial conferences. If you aren’t on this list you might be missing your next deal! Contact Christopher Ware for a full list of past industrial conference sponsors. PLUS: Standard Sponsorships come with the option for tabletop exhibit space, two bonus registrations, or print or digital advertising space. Note: Exhibit space is not included with the Supporting Sponsorship. You may distribute a brochure or similar material on a shared table at the conference. Recognition on conference website and in conference app. Access to conference attendee lists. Option to purchase additional registrations at a discounted rate. SPONSORSHIPS FILL UP QUICKLY! Contact Christopher Ware or call 800-666-6780, ext. 127 to reserve your sponsorship today. Renaissance Seattle Hotel is conveniently located on the corner of 6th Avenue and Madison Street in downtown Seattle. Within walking distance is Washington State Convention & Trade Center, Historic Pioneer Square, Elliott Bay Waterfront, Seattle Art Museum and a variety of shopping experiences at world famous Pike Place Market, Nordstrom Flagship Store and Pacific Place. Also nearby are Centurylink Field and Event Center – Home of the Seattle Seahawks & Seattle Sounders and Safeco Field – home of the Seattle Mariners. Book the Renaissance Seattle for CRE.Insights: The Last Mile. The Renaissance Seattle is offering a special rate of $189 single/double, exclusive of taxes. The discounted rate will be offered until Monday, February 12, 2018, or until the room block has been filled, whichever occurs first. To book a room at the Renaissance Seattle, call the toll-free number 1-800-546-9184 or call the hotel directly at 206-583-0300. You may also book online using NAIOP’s direct booking website. Ask for the special NAIOP rate of $189 single/double, exclusive of taxes. The rate will be extended for three days before and after the blocked dates (March 1-10, 2018), subject to availability. A deposit equal to one night’s stay is required to hold each individual’s reservation. Should a guest cancel a reservation, deposits will be refunded for rooms cancelled more than 72 hours prior to arrival. Name changes to room reservations may be made up to one day prior to arrival at no additional charge. To learn more about transportation options to and from the Renaissance Seattle, visit the hotel website. NAIOP attendees will receive a 10% discount off the overnight self-parking fee of $43 per night. Valet parking is available for $55 per night. Business attire is recommended for conference attendees. Average March temperatures in Seattle range from an average high of 54 degrees to a low of 39 degrees. Gain industry insights and expand your network when you attend CRE.Insights: The Last Mile. 98% of past NAIOP industrial conference attendees say they made new or improved relationships, and 40% made or started a deal. 20 of the top 30 industrial real estate owners attended NAIOP industrial conferences in 2017. These 20 companies represent 2.06 billion square feet of industrial real estate.